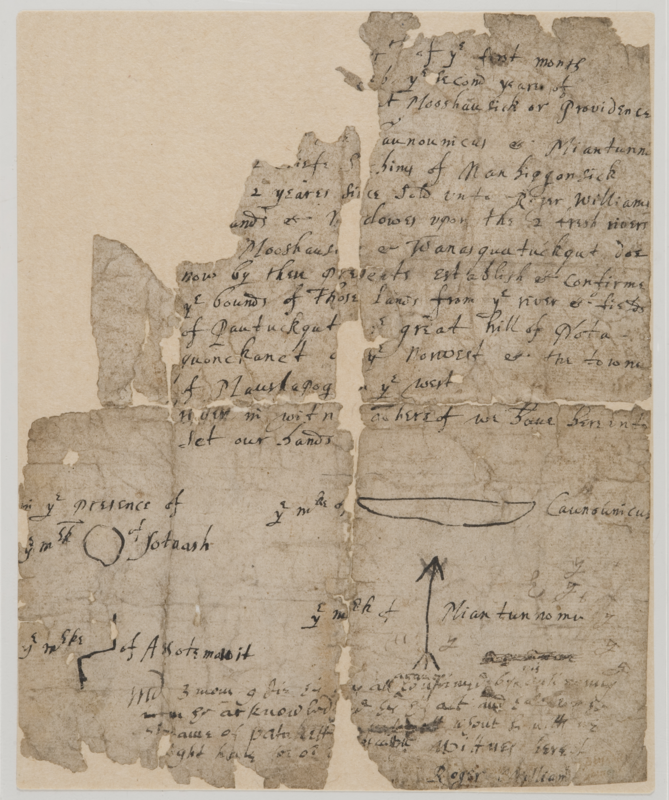 The earliest land deed in the Providence City Archives dates from 1638 and confirms earlier verbal and written agreements between Roger WIlliams and the Narragansett sachems Canonicus and Miantonomo. The sachems drew their "signatures" with the symbols of a bow and an arrow, respectively, on the deed that granted land to Roger Williams. It was important to Roger Williams to establish a written record of his land agreements. Not only did it help him to establish his own authority over the fractious settlers who often followed him to Narragansett Bay, it was essential to define these modest communities as legitimate places on the map, separate from the neighboring colonies of Massachusetts Bay, Plymouth, and Connecticut. Legitimate agreements with the sachems were also invaluable for another reason. Roger Williams had been banished, in part, for asserting the original right of the indigenous peoples to their land. By showing that he had purchased his land with their consent, he was making a powerful moral and legal argument. As he later explained, "Rhode Island was purchased by love." Ranger John McNiff talks about the orginal deed.